Rachel's training not only specialised in high quality grooming techniques, but also in relaxed and gentle dog handling, using skills in the canine / human relationship to give every dog visiting the salon a relaxed and enjoyable experience. It is Rachel's wish that your 'perfectly pampered pooch' will look forward to visiting The Groom Room, time and time again! I was one of those kids who begged their parents for a dog since I could walk! I have always been interested in understanding animals, and became interested in pet training at the age of six, taking my Dachshunds to pet classes. I was hooked! 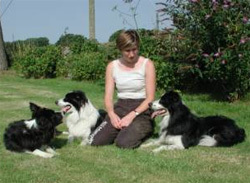 I love training my own collies for Competitive Obedience, as well as helping others train their pets, and have enjoyed competing in the prestigious 'Obedience Championships' at Crufts. As a teenager I cut and styled hair for my friends and family. This love has never left me, and latterly I have channelled my passions into "Turning Out the Perfectly Styled Pooch"! I have an indulgent salon, equipped with the latest grooming facilities and equipment. My wish is your dog's happiness, and the pleasure you gain from proudly showing off your beautifully groomed dog. Our gallery on this website helps to demonstrate our specialised grooming techniques.